Maria Haberer and I will be presenting our latest communication, Structural Conditions for Citizen Deliberation: A Conceptual Scheme for the Assessment of “New” Parties , also at IDP2016 – Internet, Law and Politics. Building a European digital space, organized by the School, Open University of Catalonia, and taking place in July 7-8 2016 in Barcelona (Spain). Its content will be quite similar to what we presented at CeDEM2016 in Krems, Austria, though this version has been improved with the comments from the attendants of this conference and, of course, the reviewers of IDP2016. A pre-print of the paper can be downloaded below. Note that some minor issues can differ from the final version to be published in the proceedings of the conference. 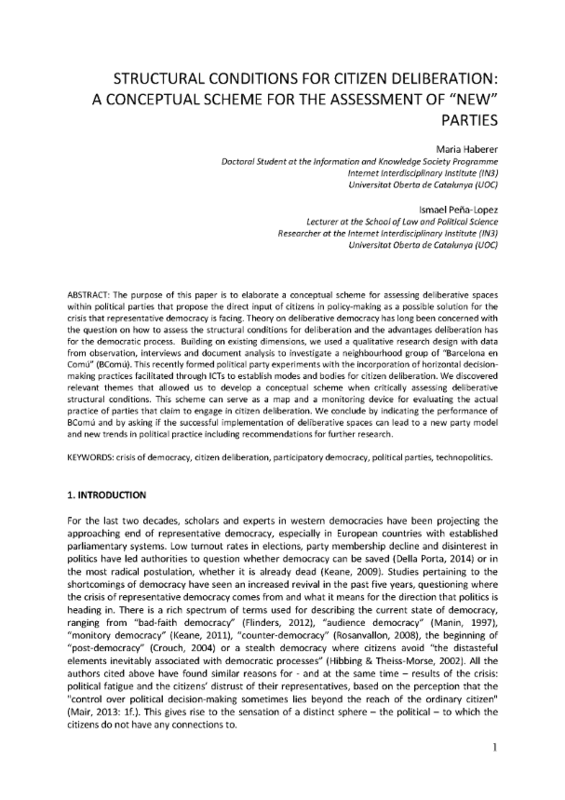 The purpose of this paper is to elaborate a conceptual scheme for assessing deliberative spaces within political parties that propose the direct input of citizens in policy-making as a possible solution for the crisis that representative democracy is facing. 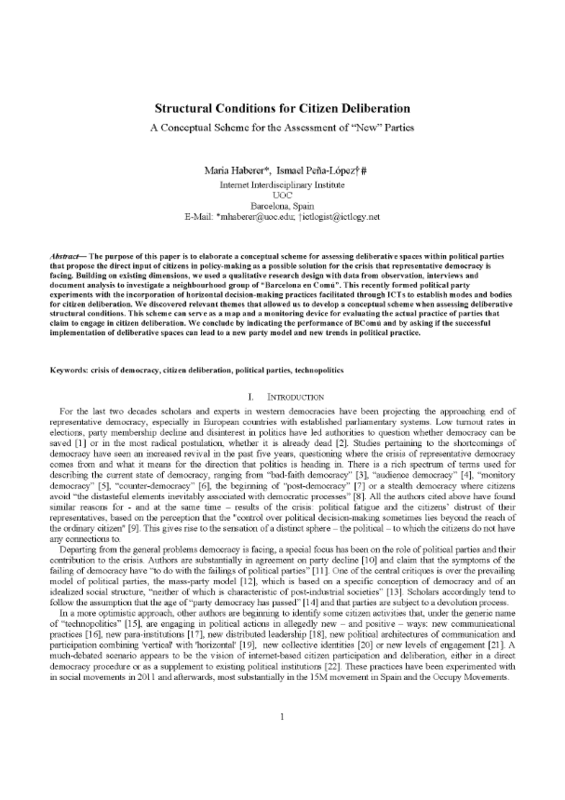 Theory on deliberative democracy has long been concerned with the question on how to assess the structural conditions for deliberation and the advantages deliberation has for the democratic process. Building on existing dimensions, we used a qualitative research design with data from observation, interviews and document analysis to investigate a neighbourhood group of “Barcelona en Comú” (BComú). This recently formed political party experiments with the incorporation of horizontal decision-making practices facilitated through ICTs to establish modes and bodies for citizen deliberation. We discovered relevant themes that allowed us to develop a conceptual scheme when critically assessing deliberative structural conditions. This scheme can serve as a map and a monitoring device for evaluating the actual practice of parties that claim to engage in citizen deliberation. We conclude by indicating the performance of BComú and by asking if the successful implementation of deliberative spaces can lead to a new party model and new trends in political practice including recommendations for further research. Haberer, M. & Peña-López, I. (forthcoming). “Structural Conditions for Citizen Deliberation: A Conceptual Scheme for the Assessment of “New” Parties”. In Balcells et al. (coords.) Internet, Law and Politics. Building a European digital space. Proceedings of the 12th International Conference on Internet, Law & Politics. Universitat Oberta de Catalunya, Barcelona, 7-8 July, 2016. Barcelona: UOC-Huygens Editorial.